All five graduates of the Class of 2016 at Ark City Christian Academy plan to continue their education at Cowley College. 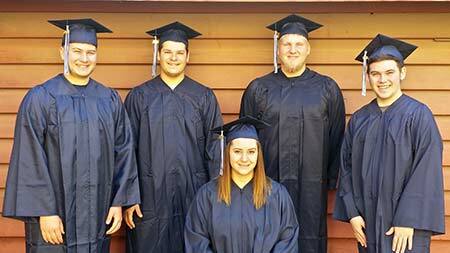 The graduates are, Nathan Stanley, JC Pappan, Kara Hinson, Andrew Potter, and Jordan Vande Giessen. Nathan Stanley, son of David and Jodie Stanley, is interested in pursuing a career as an electrician or possibly as an electrical engineer. He was awarded a Cowley Presidential scholarship. JC Pappan, son of Wes and Melody Pappan, received an Eagle Scout scholarship for tuition and books, as well as a Kiwanis scholarship. He is undecided on a major at Cowley College. Kara Hinson, daughter of Kent and Shannon Hinson, is interested in pursuing a career in the field of education. She was awarded a Cowley Dean’s Scholarship. Andrew Potter, son of Kelli Potter, is interested in becoming an EMT or Paramedic and is the recipient of a Cowley Presidential Scholarship. While, Jordan Vande Giessen, son of Bill and Penny Vande Giessen, is interested in computer programming. He received a Cowley Technical Theater scholarship for tuition and books. Those pictured are, from left, Nathan Stanley, JC Pappan, Kara Hinson, Andrew Potter, and Jordan Vande Giessen.